The Surfing Lessons on this page continues on from surfer girls surfing lessons 1-3 and 4-6. So If you haven't studied up on those you have to take the drop on these and then come back to this set. So finally you have made it out the back and are sitting in the lineup, well maybe to one side of it. First thing to do is have a look back at the beach and pick yourself a marker, a tree usually. This will let you know if there's a rip running and which way you are heading in relation to where the waves are breaking. Try and sit by straddling your board, it's easy after a few fall offs. just relax into it and control your balance through your legs. After a while your legs will do it themselves. Okay the surf is small and probably a bit mushy. This is the best conditions for the beginner. You see your wave coming, turn the surfboard as you lie back down towards the beach, keep an eye on the wave by looking over your shoulder and paddle. Try to time your paddle so the wave isn't going to break before you or on top of you. You will feel the waves momentum start to pick you up. Paddle hard and fast and leaning forward not back. This is what its all about, remember like in your paddling keep your chest high so you don't nose dive. Head down the face into the trough of the wave let yourself go out in front of the wave, straight ahead is good for now and then do your best to stand and be counted. After several attempts if you succeed getting to your feet, try to stand as soon as you feel the waves surge underneath you and ride standing up into the trough and out the front. 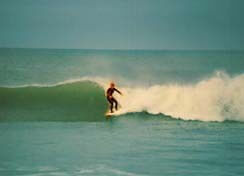 Once you feel you have mastered that stand and angle your board along the face and feel the speed. Experiment with turning by putting a little weight on your back foot and lean into the wave. Straighten up and then do it again. If you are still with us then congratulations, you are ready to wear your boardies with pride and start to work on your image. Image and style go hand in hand in surfing. Remember the three c's , cool, controlled and connected. Most important. Write it on the front of your surfboard so you see it as you are surfing. First off cool, it can help to remember this if you find yourself getting frustrated because you just blew your last three waves, or haven't managed to get one, while others around you are picking them off. Your time will come, move in a little and just take anything, for some reason this can seem to break the spell. Next is controlled. From the start of your surfing you should always analyze your moves and attempt to improve. Don't get caught in a rut of surfing each wave the same way. Build up a repertoire of moves. Watch others and tell yourself if they can do it I can too. Try and always stay in control of your moves. You do this by first knowing a little bit about each manouver. There are a lot of techniques to follow and they will go a long way to enhancing your surfing. The third c is connected. Many surfers make the mistake of two stage turns. They'll start a turn and then have a little break in the middle of it. This usually happens to the surfer who hasn't followed the control 'c'. In their minds they haven't pictured the complete move as one sequence. Not only should a move be a flowing movement but an advanced surfer will have the whole wave as a smooth and flowing sequence. Linking one manouver to the next, controlling and gaining speed as they go. I'm putting the three c's in this beginners tutorial because it is important to develop a good surfing habit from the beginning. You'll progress faster and have a style and basically have a lot more fun, not to mention respect in the line up which means more waves. Good luck surfer, this concludes the beginner surfers tutorial. Copyright © SurfTravelCompany.com. All rights reserved.